Bike Walk Lincoln Park: New nearby bike lanes on Halsted, Elston and Clark! New nearby bike lanes on Halsted, Elston and Clark! In the past few weeks, new or upgraded bikeways have appeared close to Lincoln Park! It's funny that many have come near, but none are within the boundaries of our neighborhood. Below is a screen shot of the Active Transportation Alliance's ongoing bikeways tracker, taken on August 25, 2012 (I added the circle). upgrade in progress. 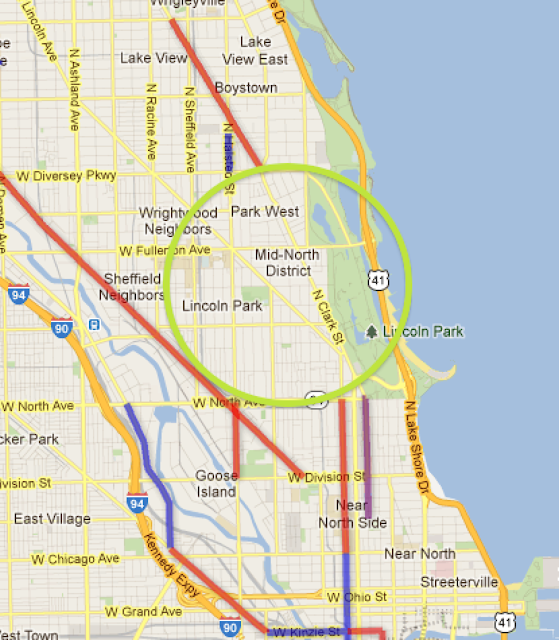 Green circle = invisible force field keeping improved bike lanes out of Lincoln Park. Even though none of the new bikeways are in our neighborhood, they are useful when we ride to and from other destinations, of course. I checked them all out and took a few pictures to share. 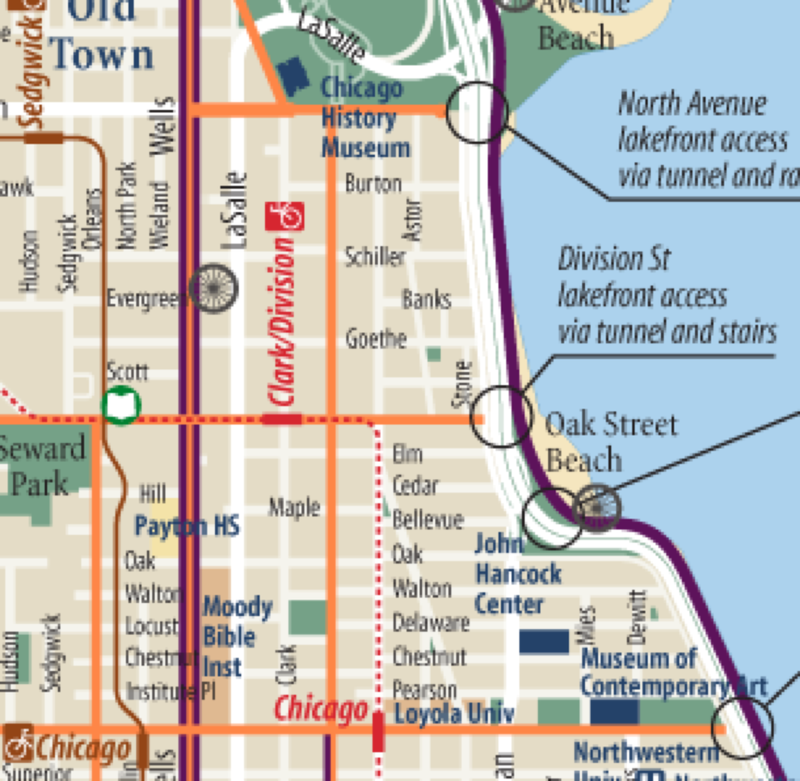 First up is Halsted Street, from Diversey to Wellington. This used to be a conventional bike lane, with a simple stripe of paint next to the line of parked cars, with bike symbols added periodically. However, they hadn't been repainted for a long time, and were nearly invisible in many spots. 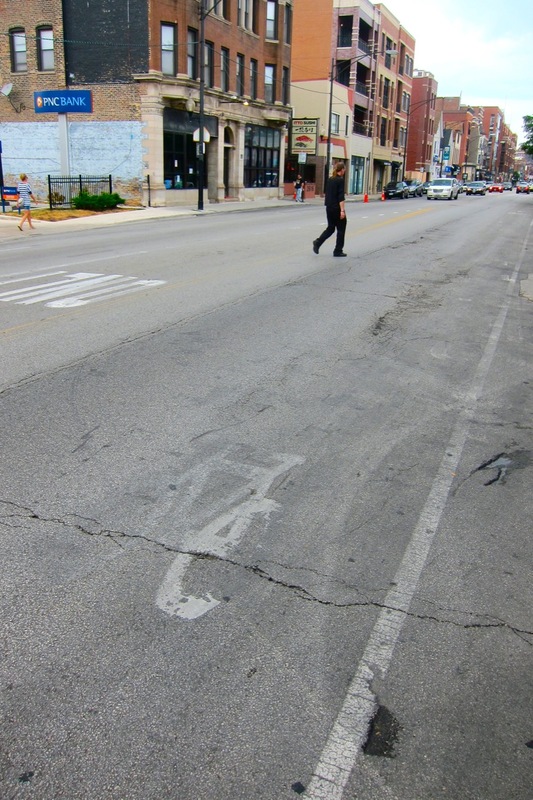 The Halsted Street bike lane has not been repainted in years, and much of it looks like this. The new lane is a buffered bike lane, meaning there is extra width to the lane, with an additional line and diagonal stripes on the outside of the lane, which is a visual reminder to motor vehicles to stay out the bike lane. On the whole, I like the "outside" buffered bike lanes. The extra room is nice, and the newly painted striping does give a certain level of support to a person riding a bike. However, buffered bike lanes of any kind don't stop cars from drifting into the lane, using it as a passing lane, or using it to double park. The intersections on the Elston protected bike lane have very bright green paint providing added visibility. The Elston protected bike lane is a great upgrade for people who use Elston as a commuter route from parts of the city to the northwest to the central business district area. Some people might even start using it as a bike commuting route instead of Milwaukee Avenue due to the added level of protected it affords, and more space designated for bicyclists. But for now, it's not extremely useful for those of us living in Lincoln Park, as it runs through an industrial area with few destinations alongside it. Clark Street from North Avenue on the north to Oak Street on the south is receiving buffered lanes. This one is not quite done yet, so these pictures below are of a work in progress. This stretch of Clark previously had nothing at all for bicyclists. On the bike map, it had the dreaded orange line, which is officially named "Recommended Bike Routes" but in reality meant: There's no protection for you here, but lots of bicyclists use this stretch anyway, so have faith in the safety-in-numbers theory and good luck! Clark Street south of North Avenue had the dreaded orange line on the bike map. Clark Street on this stretch is now getting a buffered bike lane, with an inside buffer, meaning the extra stripe is on the inside of the lane, presumably to help bicyclists remember to ride outside the door zone. The bike symbols are not in, and the intersections are not all complete. There are some parts where the bike lane disappears completely due to lack of width from the presence of parked motor vehicles, which doesn't seem optimal, but I'm hoping the bikeways planners have something good up their sleeves for us, and I'll withhold pictures and judgment until the entire stretch is complete. Have you ridden any of these new bikeways? This is a really good thing that your roads have seperate lanes for those who take a bike. I think this is the main reason why I don't see anyone riding a bike in my town.